Léna Roy: Anyone Can Cook, Er, Write . . . if they want to . . . Anyone Can Cook, Er, Write . . . if they want to . . . It is a small group at Writopia today, even though classes have ended in preparation for the summer program, three of my Saturday girls wanted to come for another session. I've been with them every Saturday afternoon this school year. I've brought brownies, and they all want to play "hot laptop", insisting that I play with them. Yay! (This is just like the game hot notebook I play with my Girls Write Now mentee Meg, only with more people and on (obviously) laptops.) We will have four stories by three o'clock. As a creative writing teacher, I passionately believe that everyone is capable of deep creative expression. Whether you have a desire or "calling" to do it, is a completely different thing. 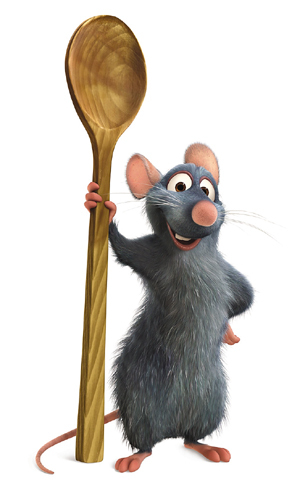 The movie Ratatouille comes to mind, with the overt message: Anyone can cook. But the more interesting message for me is that anyone can do anything with an attitude of perseverance, practice, and desire. Is talent what you are good at, or what your soul feels called to? Are these mutually exclusive? My soul feels "called" to writing fiction - I recognize that "calling" as a gift, but not necessarily a talent. So in order to serve that gift, I need to practice writing. When my fingers flow easily and quickly over the laptop, it is the gift of inspiration. Most of the time though, I have to sit down, roll up my sleeves, and "work". So it's not the gift versus the work, is it? What do you think? There are genius writers out there - I however, am not one of them. For me, it's that old adage of 5% inspiration, 95% perspiration - that's what I have to focus on. Thank you for answering my questions, especially in such a deep, thought provoking post. I wanted to cheer when I read your response. It was kinda like watching the World Cup today. Odd comparison, I know, but the feeling of supporting and cheering people on as they work hard to serve their calling/heart's desire is much the same. I agree that the calling is a gift and we must serve the work so that it might bless others. Thank you again. Gift or work? Maybe both, each in its time. Sometimes in the flow, when words come easily, other times doing the discipline of being present even when the words seem out of reach. And perhaps those times when there might be a rat sitting on your head, pulling your hair this way and that so that your fingers strike the right keys. Those days, you just have to laugh at yourself. But every day, you're still there. The, my best mates, is why you ought to at all times attempt carryout a superior earliest panerai replica sale sense. Some people, both women and men, happen to be forming your earliest sense for prada replica within just 18 minutes. Allow me to inform you of undoubtably that make it happen average joe. Lake look at one other fellow within the grocery who may be being dressed in a good loosened sporting events business logo first tee t-shirt, a good baggy set of fake gucci bags, together with male clear plastic flip flops, That i come up with some sort of appraisal for her (and it's really possibly not helpful) during related to 5 minutes. Add more colors towards your tag heuer replica sale. Many men normally mainly dress in greyish, red together with ebony. Look like your look nowadays has long been telling "I usually do not care"? Could very well be searching for certain layout assistance. Here's 6 fast tips on how to make improvements to your look together with freshen up an individual's looks. Many other omega replica, the sexes identical, realize pieces. The main break verdict that many of us make of some other individual, for the likeability together with splendor and techniques, is reached in mere 18 minutes.